All land animals need to conserve water. This is because the external environment is usually drier than the internal environment of the animal’s body. Thus, water will tend to diffuse away from the body. There is also a need to excrete waste products such as urea, which is dissolved in water. This creates a problem! 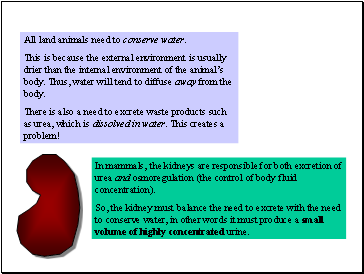 In mammals, the kidneys are responsible for both excretion of urea and osmoregulation (the control of body fluid concentration). 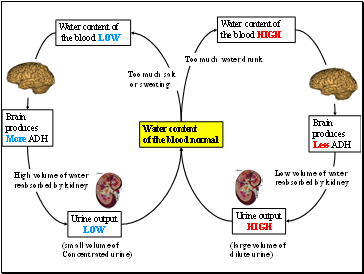 So, the kidney must balance the need to excrete with the need to conserve water, in other words it must produce a small volume of highly concentrated urine. 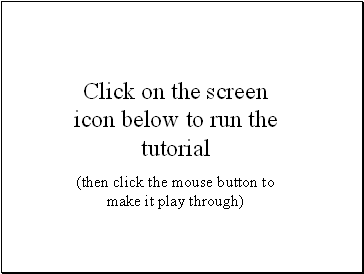 The operating unit of the kidney is called the nephron. 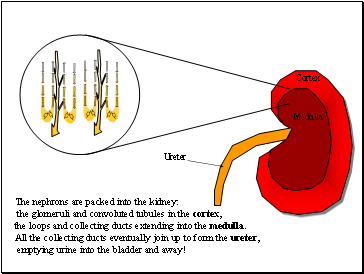 There are about 1 million nephrons in each of the 2 kidneys. 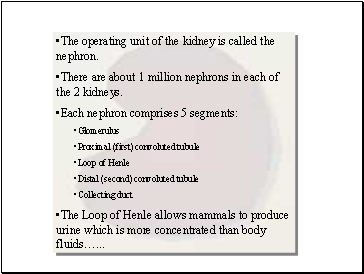 The Loop of Henle allows mammals to produce urine which is more concentrated than body fluids… . 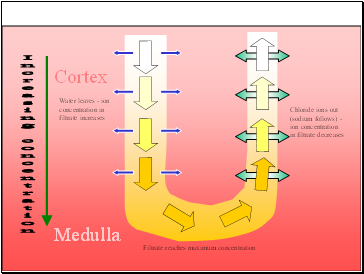 the loops and collecting ducts extending into the medulla. emptying urine into the bladder and away! Several nephrons empty into one collecting duct. 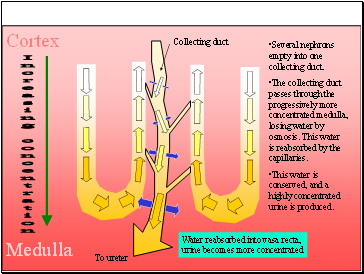 The collecting duct passes through the progressively more concentrated medulla, losing water by osmosis. This water is reabsorbed by the capillaries.